Junoon fans rejoiced when Coke Studio hinted that a Junoon reunion was in the works for the latest season to be aired in August, especially given the Sufi-Rock band’s 25th Anniversary one which would have complimented the country’s 70th year of independence. Even Ali Azmat seemed to be on board but the prospect did not work out at the eleventh hour. Despite the disappointment, Junoon fans may be in for a heavy dose of nostalgia as Coke Studio confirmed a rendition of the band’s iconic “Sayonee”. Since then, Salman’s presence as, now, Coke Studio guitarist seemed to be stagnant; that was until he posted pictures from his time in the studio in tweets, each with captions that may hint at more than was expected of him. 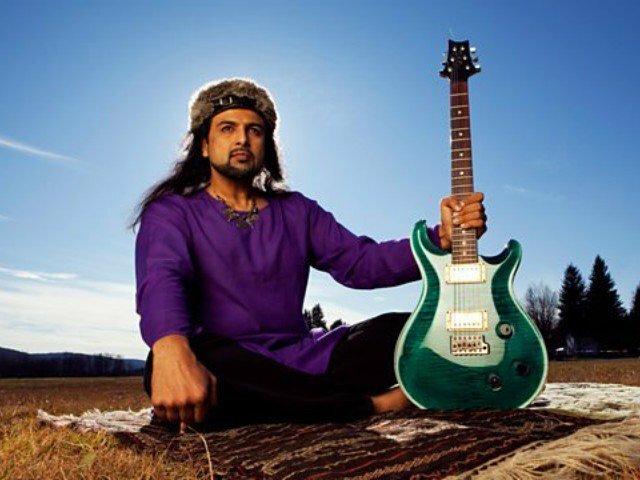 Here, Salman Ahmad quoted the band’s surreal track ‘Ghoom’ from the album ‘Parvaaz’, alongside a picture of himself. Perhaps the track lineup will include this track alongside the confirmed ‘Sayonee’. Fans quickly recognized the lyric and Salman Ahmad seems to approve. Moreover, he also tweeted a picture captioned ‘Jugalbandi’ perhaps hinting at a possible track that pays homage to the track of the same name on Junoon’s fourth album ‘Azaadi’. Salman Ahmad, also tweeted a picture of himself with Rahat Fateh Ali Khan and guitarist Sherjan Ahmad, captioned ‘Rock-Qawalli’ coming soon. As of now, it can only be hoped that the hints are realized and if that happens Junoon 25th Anniversary is likely to be well remembered.